Compound free weight exercises allow you to work a wide range of motion, not to mention a natural range of motion. Although machines are generally good for building muscle and boosting metabolism, there isn’t a lot of them that allow you to do what you can with free weights. The thing with machines is that despite the fact that they can be adjusted to suit many body types, they are still considerably limiting and restrictive (e.g., they only allow for a certain range of motion which can be unnatural for some people). Another thing about machines is that some machines only allow you to load up up to a certain amount of weight. Having said that, if you really want to get ripped, you will be better off if you stick with compound free weight exercises. And here are (in no particular order) the top exercises that will build you the most muscles, burn the most fat, and get you ripped. The great thing about bent over rows is that it makes you use a lot of muscles in your body. Just to give you some examples, this exercise makes you use your back, your glutes (or gluteus maximus), your hamstrings, and many other muscles/muscle groups in your body. And as you may already know, the more muscles you use the more hormones your body is going to release. Additionally, this exercise has several variants (i.e., it can be performed in various ways) which allow you to modify your routine as you go along. A good place to start is the underhand close grip. Then, as you get better at it, you can go with the overhand close grip or the overhand wide grip. Deadlifts are a hip-dominant exercise. As such, they stimulate your hamstrings, glutes, and lower back. Additionally, it also works your quads, shoulders, arms, traps and most of your back. And like the bent over rows, there are several ways to perform deadlifts (e.g., wide stance, narrow stance, etc.). When performing deadlifts, try to get your hips and shoulders to rise at the same time. You don’t want to kick out and drag your upper body up as this will increase your risk of getting a back injury. Make sure that you keep your back straight. Also, you should keep the weight on your heels at all times and concentrate on using your glutes. These exercises let you work the whole head of your shoulder and get your core working. Additionally, they are also metabolically more demanding so your metabolism will get boosted a lot higher by doing these exercises. Cleans involve complex movements so I advice you to look for videos online on how to perform them properly. There are several types of bench presses, among them are incline press, flat bench, and decline press. You can also do all of those variants in a couple of different ways–wide, medium, and close grip. 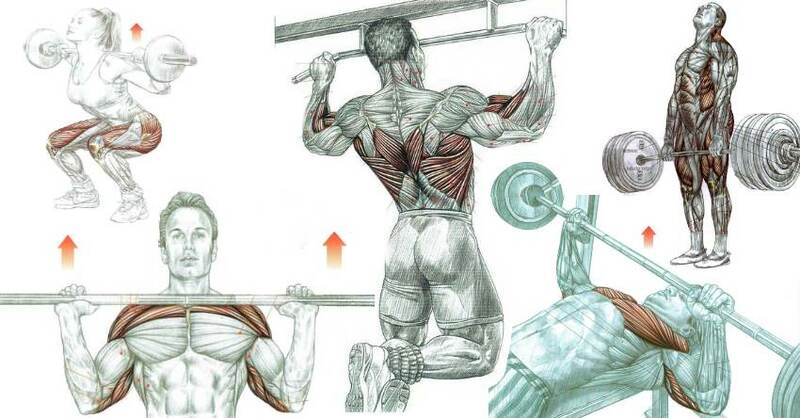 But generally, bench presses will work up your chest, shoulders, and triceps. Bench presses are also excellent for boosting your metabolism. There are a bunch of other compound exercises that you can do, but these are among the best and most popular exercises that will get you building the most muscles and all ripped up.